The Hellyer brothers, left to right, Clint, Clete, Cole and Clay were a happy group after Boyle County’s semifinal victory over Elizabethtown. The brothers have been part of 8 state championship teams at Boyle County. 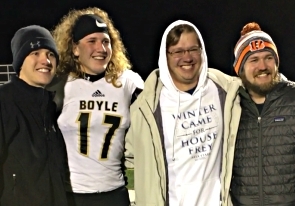 The Brothers Hellyer of Boyle County will have a big time talking smack and patting each other on the back when their family gathers for Christmas in a couple weeks. And the youngest of the Hellyer boys, Clete, will no doubt be in the middle of it all now that he’s joined his brothers’ championship club. When Boyle County beat Corbin in the Class 3A football finals last week, it capped an incredible run of eight (!) state titles for the Hellyer family. Clay Hellyer, a wide receiver/defensive back, was part of Chuck Smith’s championship teams in 2001, 2002 and 2003. Cole Hellyer, an offensive lineman, helped Larry French’s Rebels win titles as a junior and senior in 2009 and 2010. Clint Hellyer, a wide receiver/defensive back, was a freshman and sophomore on those same championship teams. Clete Hellyer, a defensive lineman/linebacker, finally got his turn to celebrate a state title in this his senior year when Boyle County whipped Corbin 40-21 at UK’s Kroger Field last Friday night. For Cliff Hellyer, having his four sons be part of so many state championships at Boyle County is almost too much to comprehend. After watching his three older boys’ successes, Cliff was hoping his youngest son could one day be part of a title team, too. And his brothers couldn’t be happier for him. Clete actually had shared in a couple of earlier Boyle County championships. He was a ball boy on the 2009 and 2010 title teams. Clete didn’t get a ring for either of those years, but he certainly earned one this season. His biggest moment came in the Rebels’ semifinal showdown at Elizabethtown. Boyle County was clinging to a 14-7 lead when Clete clinched victory by intercepting an E-town pass with 28 seconds left. His three brothers, up in the stands, were celebrating, too. Cole was home from law school at Notre Dame on Thanksgiving break and got to witness Clete’s shining moment in the semifinals. He was glad he did because he was unable to get home for Boyle County’s championship game against Corbin. Even though his dad and mom (Jeanne), brothers Clay and Clint, and sisters Holly Jo and Hayley were at Kroger Field, Cole probably had a better view. Back at Notre Dame, he was live-streaming the game and watching it in hi-def on a big-screen TV. Getting to play on UK’s home field was a big deal for Clete, too. His brothers won their championships either at Fairgrounds Cardinal Stadium or Papa John’s Cardinal Stadium in Louisville, or WKU’s Houchens/L.T. Smith Stadium in Bowling Green. Clete knows he got lucky when Chuck Smith returned to Boyle County in 2014, his freshman year. The best of Boyle County football has resulted in eight championships (1999, 2000, 2001, 2002, 2003, 2009, 2010 and 2017), and the Brothers Hellyer have collected eight rings among them. Yes, it’s going to be a fun get-together come Christmas.